1. Shay No. 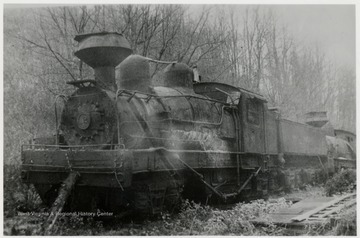 12, Left Side View, Standing Ready to be Junked. Shay No. 12, Left Side View, Standing Ready to be Junked. 2. 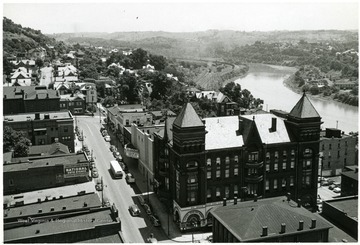 Aerial View of Charleston, W. Va.
Aerial View of Charleston, W. Va.
3. 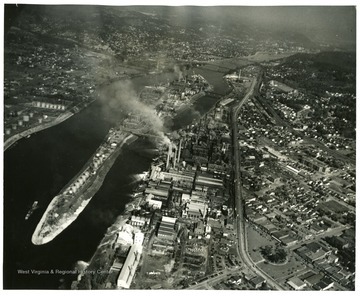 Aerial View of South Charleston, W. Va.
Aerial View of South Charleston, W. Va.
Aerial view of the factories in South Charleston, West Virginia. 4. 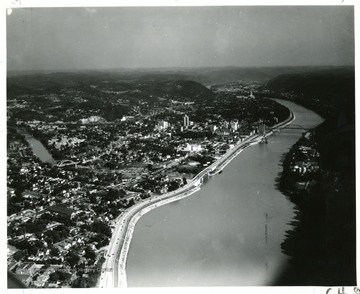 Aerial View of Charleston, W. Va.
View of Charleston, W. Va. and the Kanawha River. 5. 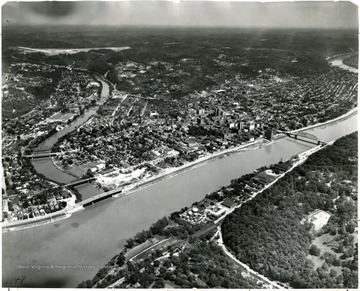 Aerial View of Charleston, W. Va.
View of Charleston and the Kanawha River. 6. Main Street, Fairmont, W. Va.
Main Street, Fairmont, W. Va.
7. Aerial View of Ritter Park, Huntington, W. Va.
Aerial View of Ritter Park, Huntington, W. Va.
Ritter park and surrounding buildings. 8. 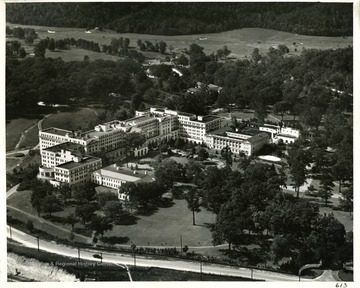 Aerial View of Greenbrier Hotel, White Sulphur Springs, W. Va.
Aerial View of Greenbrier Hotel, White Sulphur Springs, W. Va.
An aerial photograph of Greenbrier and cottages in White Sulphur Springs, West Virginia. 9. Main Office Building No. 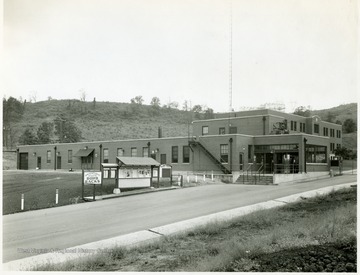 400, Morgantown Ordnance Works, Morgantown, W. Va.
Main Office Building No. 400, Morgantown Ordnance Works, Morgantown, W. Va.
From Volume One of Morgantown Ordnance Plant Pictures at Morgantown, W. Va. 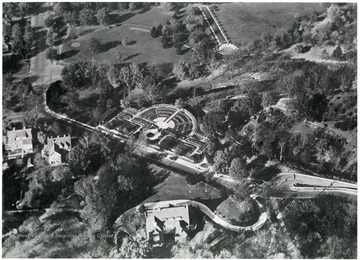 Constructed and Operated by the Ammonia Department, E. I. Dupont De Nemours and Company. Administrative and Maintenance. 10. Interior View of Gate House, Morgantown Ordnance Works, Morgantown, W. Va. 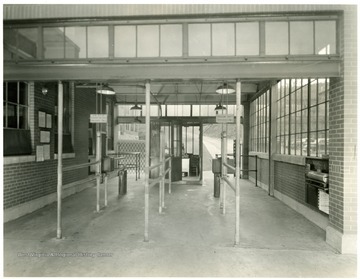 Interior View of Gate House, Morgantown Ordnance Works, Morgantown, W. Va.
Main Entrance Service Bldg. No. 401, Looking West. From Volume One of Morgantown Ordnance Plant Pictures at Morgantown, W. Va. 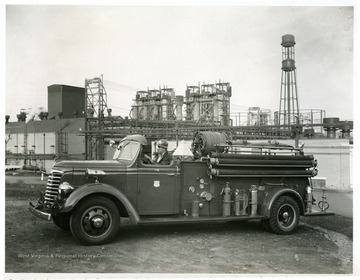 Constructed and Operated by the Ammonia Department, E. I. Dupont De Nemours and Company. Administrative and Maintenance. 11. 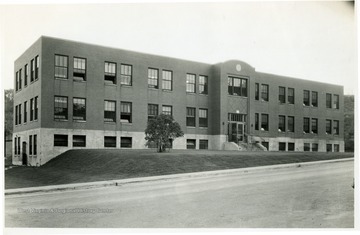 Service Bldg. No. 401, Looking Southwest, Morgantown Ordnance Works, Morgantown, W. Va.
Service Bldg. No. 401, Looking Southwest, Morgantown Ordnance Works, Morgantown, W. Va.
12. Fire Truck, Morgantown Ordnance Works, Morgantown, W. Va.
Fire Truck, Morgantown Ordnance Works, Morgantown, W. Va.
Service Bldg. No. 401. From Volume One of Morgantown Ordnance Plant Pictures at Morgantown, W. Va. 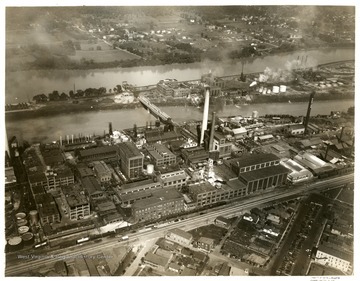 Constructed and Operated by the Ammonia Department, E. I. Dupont De Nemours and Company. Administrative and Maintenance.